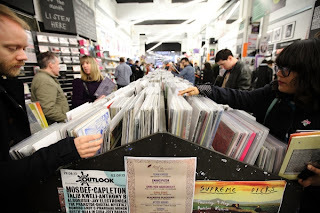 Record Store Day sales reached new heights last weekend, with total album sales increasing by three percent over last year, and by 60 percent over the previous week, according to new numbers from Nielsen SoundScan. All of Nielsen's Record Store Day figures take into account sales during the week ending in April 21st. Among the most impressive numbers were sales for vinyl LPs at independent record stores, which sold 200,000 units this year as opposed to 147,000 units last year, an increase of 36 percent. A total of 244,000 vinyl albums were sold during the entire week, and vinyl LPs also accounted for 37 percent of all album sales in any format last week. Fourteen vinyl albums sold more than 1,000 copies, as well, and 82 percent of vinyl LPs last week were sold at independent record stores. Album sales in all formats at independent record stores jumped 59 percent over sales from the previous week, while last year's RSD week only saw an increase of 27 percent over the previous week. "Record Store Day is a great way to shine the spotlight on the amazing experience that independent record stores bring to music consumers," David Bakula, senior vice president of client development and insights at Nielsen Entertainment, said in a statement. "With year-over-year growth, and exclusive packages in a format that consumers value with rich content, Record Store Day will continue to be an event that drives music consumers to independent record stores."